Historic Tewkesbury Abbey draws thousands of visitors each year to marvel at its rich architecture and outstanding monuments. The Abbey, now the parish church of St Mary, has possibly the largest and most impressive Romanesque tower in England. The West front is one of the finest original Norman examples now existing. The chancel has superb 14C stained glass and throughout the Abbey there are magnificent vaults, many of the lierne style with interesting bosses. There are three chantry chapels of the stone-cage type and the carved tombs and effigies are considered to be surpassed only by the royal ensemble at Westminster Abbey. (2) On the roof of the Trinity Chapel is the unique life-size kneeling effigy of Lord Despenser praying towards the altar. There is also a cadaver monument including five vermin crawling over the body. Although surrounded by such competing attractions it is noticeable that visitors who wander down the south aisle of the nave invariably stop at the simplest monument in the Abbey. 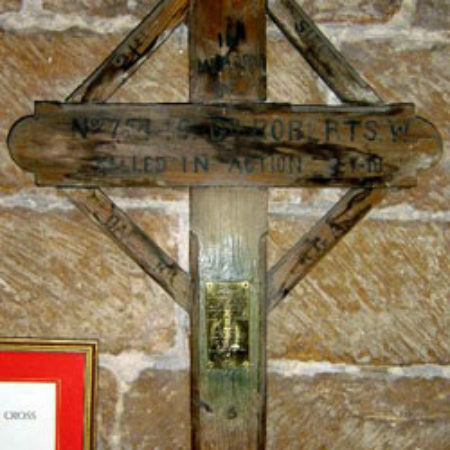 This is the wooden battlefield cross of Gunner Walter Roberts who was killed in action July 2nd, 1918, while serving with the Royal Garrison Artillery, and is buried in the Canada Farm Cemetery, Ieper (Ypres), Belgium. 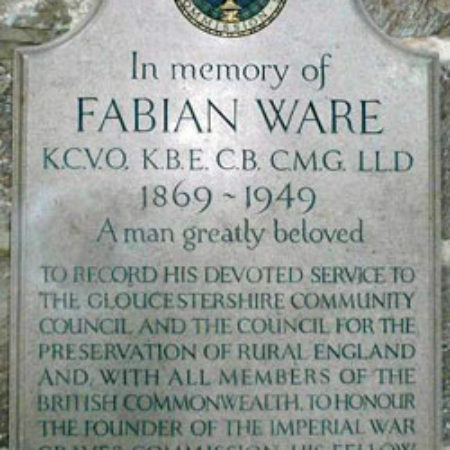 It was placed in Tewkesbury Abbey by his widow on the fifth anniversary of his death. A few miles from Tewkesbury, but still in Gloucestershire, another wooden cross can be found in St Peter’s Church, Stanway. This is even simpler than that of Gunner Roberts. It commemorates 2/Lieutenant Hon Ivo Charteris (an initial ‘J’ is wrongly given on the cross) fourth son of the 11th Earl of Weymss. He was killed in action at Loos on October 17th, 1915, while serving with the Grenadier Guards and is buried at Sailly Labourse. An elder bother, Hugo Lord Elcho, was subsequently killed in action on April 23rd, 1916, in the Katia Desert, Sinai. Their names are included on the war memorial in the church, cut into the splays of the C16 chancel window, with lettering by Eric Gill. In death no distinction was made to military or social rank in the form of the wooden cross, a policy that was deliberately continued with the permanent grave stones which were all of the same dimensions (2’6”x1’6”x3”). 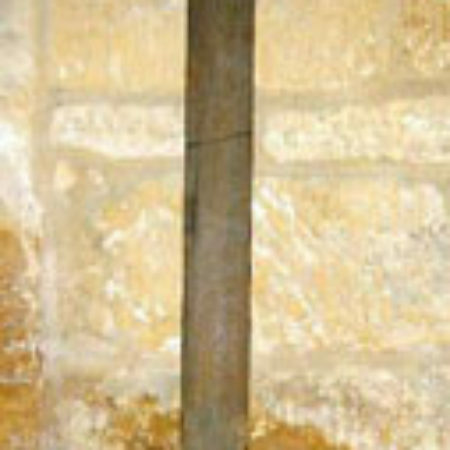 The manufacture of the crosses appears eventually to have devolved to the battalion’s carpenters, so variations can be found although they all followed a basic form. Examples of crosses being made in the field on an ad hoc basis are known. Amongst others, siblings, acquaintances, members of the Grave Registration Commission and estate workers are known to have manufactured crosses. The identifying of the graves was important to the relatives of the soldiers and for the morale of the troops. Initially it had been hoped to repatriate all the bodies but the sheer number and cost rendered this impractical. A few bodies were brought home privately by families with the means to do this. However, it was quickly realised that only wealthy families would be able to do so. The practice of repatriation was explicitly banned in 1915. 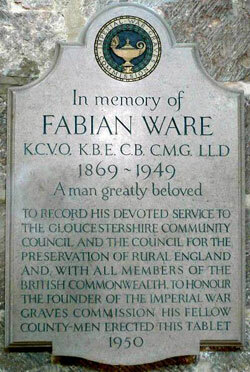 Having had a career in education and as an editor of a newspaper, Fabian Ware was 45 when the Great War broke out. He attempted to volunteer but was considered too old to fight and instead joined the Red Cross. A fluent French speaker, he arrived in France in September 1914 to command a mobile Red Cross ambulance unit. He soon realised that there was no official body with the responsibility to record and care for the graves of the soldiers. Therefore his unit began recording and caring for all the graves they could find. The Army quickly recognised the importance of this work and he and his organisation were transferred from the Red Cross to the Army in 1915 as the Graves Registration Commission. 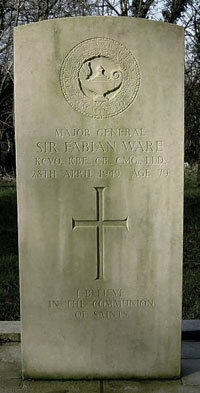 Ware was given the local rank of major. By 1918 some 587,000 graves had been identified, while a further 559,000 were registered as having no known grave. He subsequently realised that something needed to be done to establish permanent cemeteries after the war in order to create lasting memorials to the fallen soldiers. Through his tireless efforts the Imperial War Graves Commission was formed on the 21st of May, 1917, fronted by the Prince of Wales with Ware as the Vice-Chairman. The Commission eventually changed Imperial in the title to Commonwealth (CWGC). 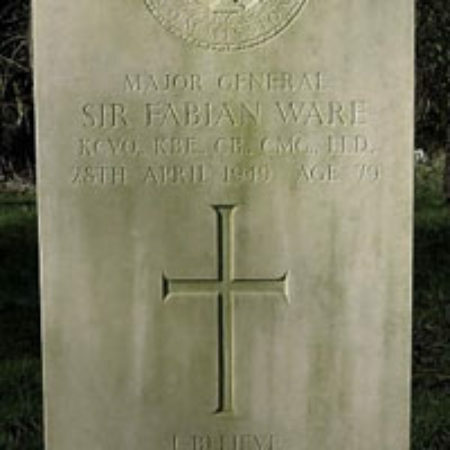 The highly decorated and esteemed Major General Sir Fabian Ware died April 29th, 1949, and is buried in the graveyard of Holy Trinity Church, Amberley, in Gloucestershire. He was honoured by receiving a Commonwealth Grave style headstone which is maintained to this day by the CWGC. Anyone who visits the CWGC cemeteries in Northern France and Belgium cannot but be moved by their dignified and immaculate appearance and saddened by the carnage occasioned by the Great War. A similar sense of the sacrifice and loss can be experienced here by finding, proudly displayed in a local church, one of the wooden crosses. During the war it was official policy to allow only the erection of wooden crosses rather than iron because of their lighter weight which made transportation easier in the field and also they could be readily replaced if damaged by enemy action. When the permanent cemeteries were created it was planned to have all the crosses pointing east. This would satisfy both religious and military conventions. When the crosses were replaced by the distinctive permanent Portland or Hopton Wood stone grave stones the wooden ones were made available to relatives. Relatives could either travel to the battlefields to collect the wooden crosses or pay to have them shipped to England. For many relatives they were the only memorial easily available to them. These crosses became an important part of local remembrance and still exert a strong emotional appeal today. 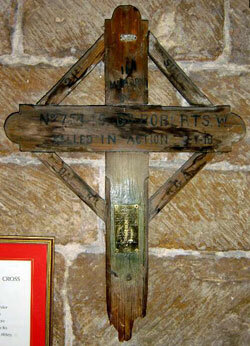 A compilation of the location of First World War crosses used to be available on the internet but has now been removed. It listed over 230 different sites in the UK. Gloucestershire alone had some 14 site entries. With 2014 being the one hundredth anniversary of the start of the Great War it is fitting to recall the final lines of ‘The Cross of Wood’ by the Gloucestershire poet Lieutenant Cyril Winterbothan. (5) Serving with the 1st/5th Gloucestershire regiment he was killed in action on August 27th , 1916, near Ovillers-la-Boiselle and is listed on the Thiepval memorial among the 72,085 names of those without a known grave. 1. Taken from the first verse of in Flanders Fields by the Canadian poet Major John McCrae. 2. The Buildings Of England, Gloucestershire 2: The Vale And The Forest of Dean, David Verey and Alan Brooks, Yale University Press, London, 2009, pp712-728. 4. Empires of the Dead, David Crane, Harper Collins, 2013.